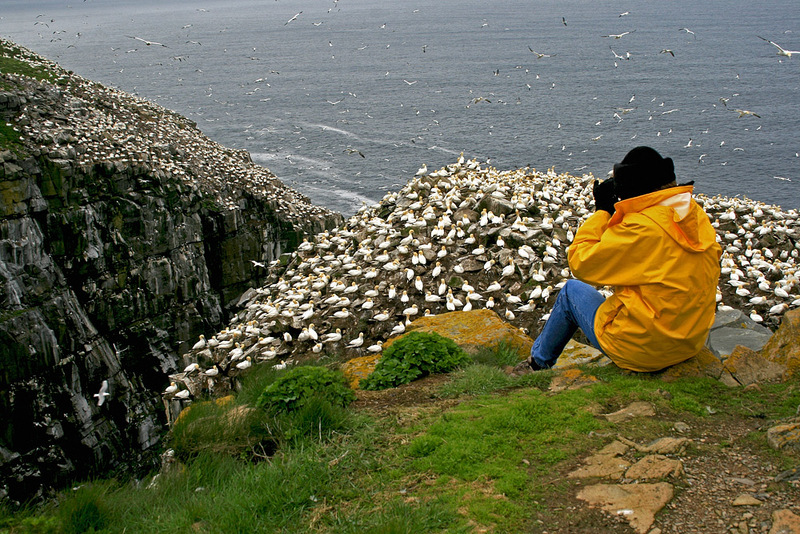 Cape St. Mary’s Ecological Reserve is home to one of North America’s largest, and most accessible, Northern Gannet colonies. 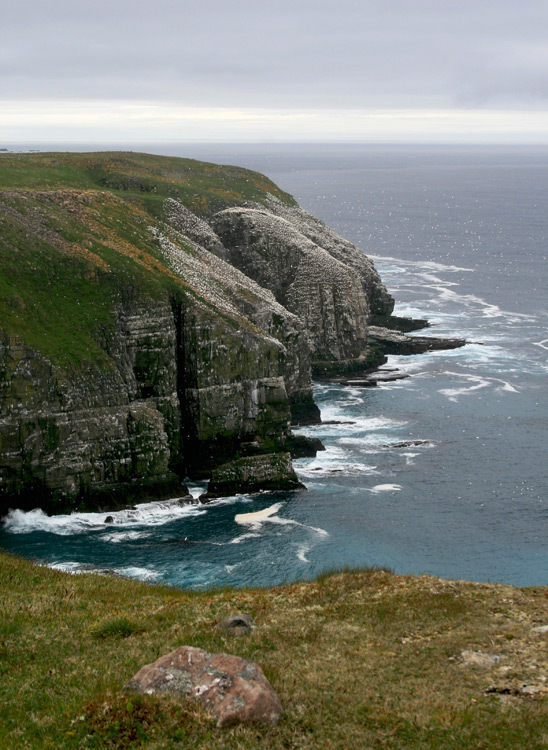 Cape St. Mary’s Ecological Reserve is an absolute spectacle of the natural world, and one of the “must-see” places for many visitors to Newfoundland. Located at the very southwest corner of the Avalon Peninsula, it is touted as the continent’s most accessible seabird colony and is one of seven seabird reserves protected by the provincial government. Few places in the world can claim to combine breathtakingly beautiful landscapes with such an awe-inspiring show of nature. The reserve, boasting steep cliffs and vast tundra, has more than 50,000 breeding seabirds and stunning landscapes. 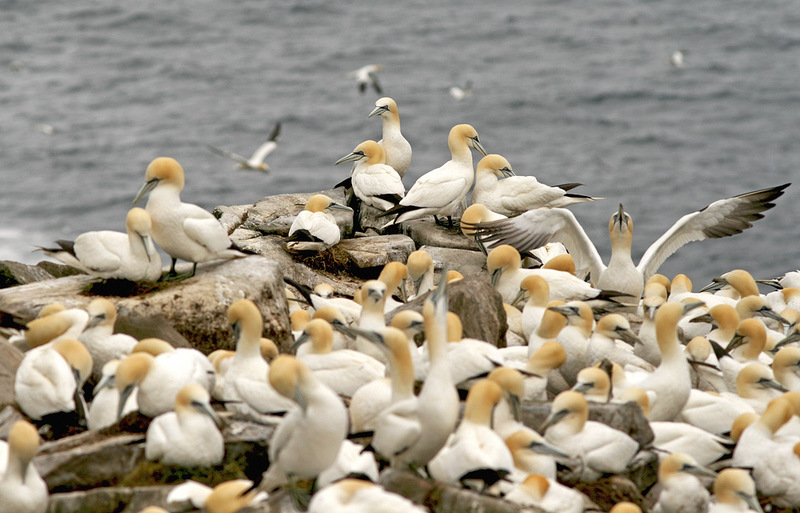 During the breeding season, more than 30,000 Northern Gannets crowd around on the top of a giant sea stack (aptly named “bird rock”) and neighbouring clifftops – making it the third largest colony in North America. Incredibly, visitors can view these majestic birds from as close as twenty meters as they go about their business of making nests, raising young, and performing their beautiful “sword crossing” rituals. Thousands of Black-legged Kittiwakes and Common Murres perch with amazing steadfastness along the very same cliffs, making the most of this tough but beautiful landscape. 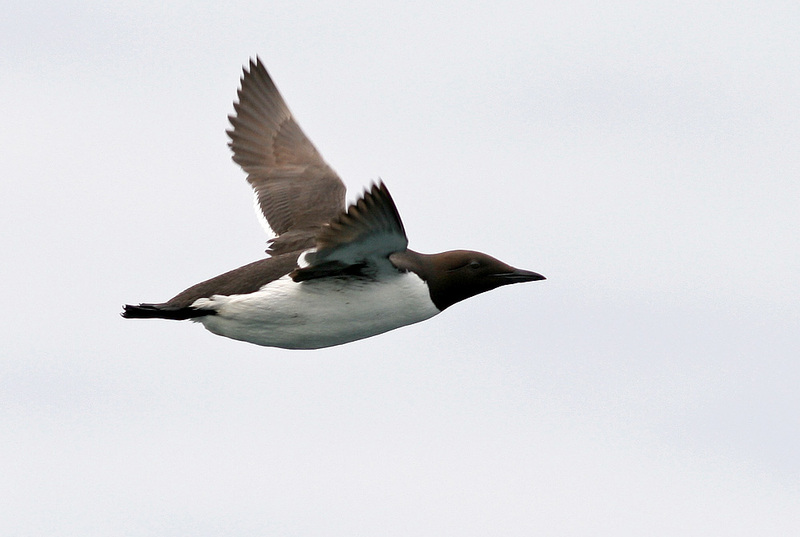 The reserve is also home the world’s southernmost breeding colony of Thick-billed Murres, hundreds of Razorbills, Black Guillemots, and even a few Northern Fulmar. Both Great & Double-crested Cormorants can be seen on the rocks below. The sheer number of birds and whirling activity can be overwhelming at times. 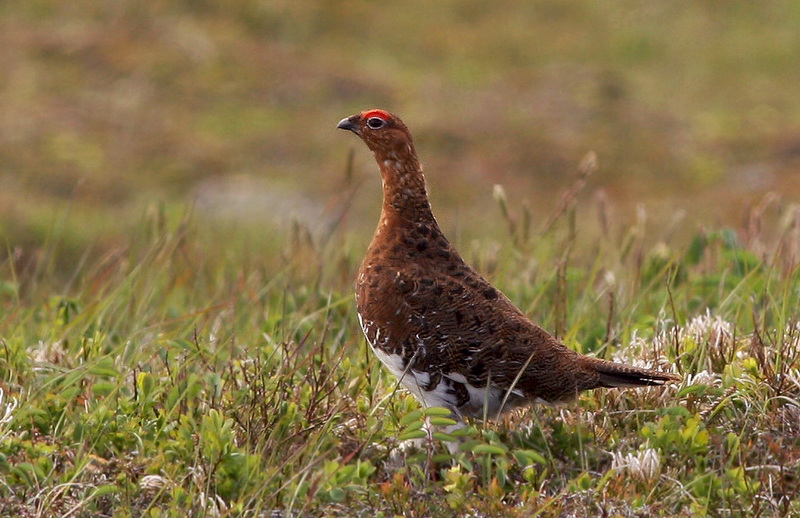 Willow Ptarmigan are year-round residents on the barrens that surround the reserve. The sub-arctic tundra (also the southernmost in the world) are also deceptively alive – with beautiful wildflowers, cryptic Willow Ptarmigan, twittering Horned Lark, the aerial displays of American Pipits and even an occasional Woodland Caribou. Bald Eagles, Northern Harriers and Common Ravens keep a close eye on the happenings, waiting for a chance to grab a meal. The close views available at Cape St. Mary’s makes for a very enjoyable seabird experience! 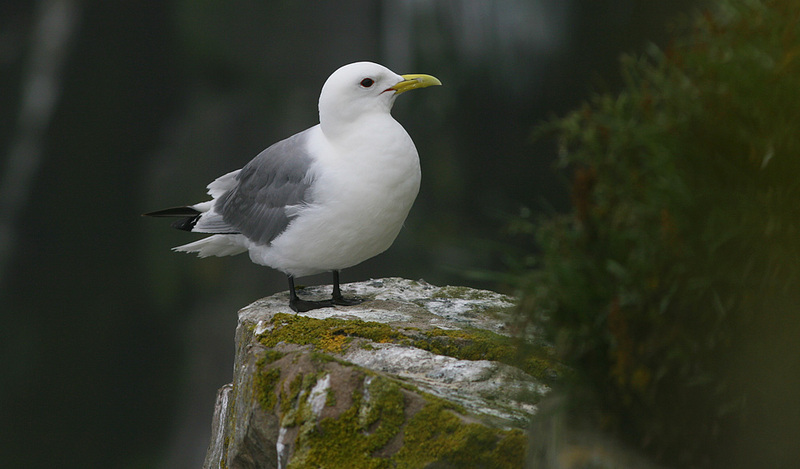 Large numbers of Black-legged Kittiwakes also breed in the reserve, showing off their understated beauty. While the reserve is less accessible during the winter months, it can be just as exciting. Thousands of sea ducks, including Scoters, Common Eiders, Long-tailed Duck and an important population of threatened Harlequin Duck, spend the winter along its steep protected coast. Dovekie and Thick-billed Murre can be seen paddling around in the frigid waters or flying past headlands, while Purple Sandpipers frolic on wave-washed jetties. Hardy birds like Willow Ptarmigan and Snow Buntings may be found on the barrens, while northern visitors Snowy Owl or even Gyrfalcon show up from time to time. Both Common (above) and Thick-billed Murre nest on the cliffs at Cape St. Mary’s, along with Razorbill and Black Guillemot. Cape St. Mary’s is located in Placentia Bay and was once one of the most celebrated fishing grounds in the world. 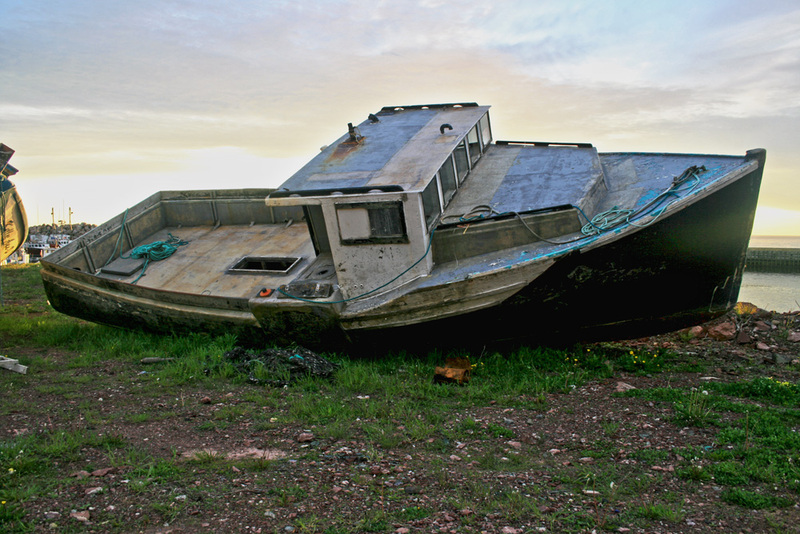 Sharp declines in fish stocks and recent moratoriums have had a major impact on nearby communities. However, strong cultural roots and a tradition of living through hard times has made for resilient (and wonderful!) people here. The rugged scenery, wealth of birds, and celebrated human history of Cape St. Mary’s makes for one of the best and most unique experiences that Newfoundland has to offer. Make sure to include it on your next visit! bird⋅the⋅rock is able to provide day tours to this amazing location, include it in longer tour itineraries, or help you make the most of your own visit through our “D⋅I⋅Y Tour” service. Contact us for more details.